Gervonta Davis vs Hugo Ruiz Highlights recap. Gervonta Davis’ elaborate ring entrance, an homage to Michael Jackson’s “Thriller,” lasted longer than his fight Saturday night. The emerging star stopped substitute Hugo Ruiz with one second to go in the first round of their 12-round, 130-pound title fight at Dignity Health Sports Park. A right cross by Davis sent Ruiz to the canvas, brought an abrupt end to the main event of Showtime’s tripleheader and enabled Davis to retain his WBA super world super featherweight title. 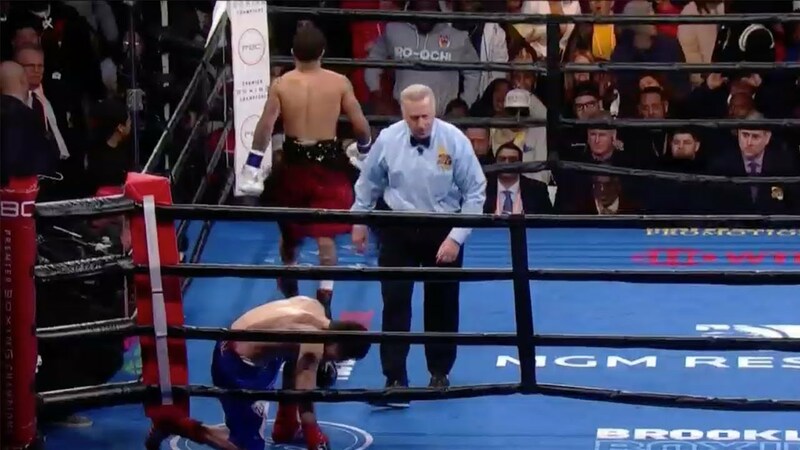 Referee Jack Reiss stopped the bout at 2:59 of the first round because Ruiz didn’t react well to his commands once Ruiz reached his feet. With promoter Floyd Mayweather and an array of other celebrities ringside, Baltimore’s Davis (21-0, 20 KOs) obviously wanted a first-round knockout and tried to stop Ruiz throughout those opening three minutes. Ruiz took Davis’ best shots until Davis drilled him with a brutal right cross that, after a delayed reaction, sent Ruiz to one knee. Ruiz got up in time to beat Reiss’ count, but Reiss didn’t like the way Ruiz reacted. Reiss said he stopped the bout because Ruiz looked down when Reiss asked him if he wanted to continue. Reiss also suggested that Ruiz had suffered a broken nose during this brief bout. Mexico’s Ruiz (39-5, 33 KOs), a former WBA interim bantamweight champion, lost by knockout or technical knockout for the fourth time in his 12-year pro career. Ruiz replaced former three-division champion Abner Mares as Davis’ opponent on only 10 days’ notice. The 33-year-old Mares (31-3-1, 15 KOs), a three-division champion from Downey, California, withdrew from his fight versus Davis last week, once he learned he suffered a detached retina in his right eye during a sparring session two weeks ago. The 32-year-old Ruiz fought for the second time in three weeks. He took the Davis fight despite that he had just gone 10 rounds in an easy victory over Alberto Guevara on the Manny Pacquiao-Adrien Broner undercard January 19 at MGM Grand Garden Arena in Las Vegas. Ruiz was supposed to fight the Philippines’ Jhack Tepora that nigh for a vacant version of the WBA’s featherweight title. Their fight was scrapped because Tepora came in 5½ pounds overweight January 18. Baltimore’s Davis, 24, fought for the first time since winning a portion of the WBA’s 130-pound title nearly 10 months ago. Davis won that belt by stopping Argentina’s Jesus Cuellar (28-3, 21 KOs) in the third round April 21 at Barclays Center in Brooklyn.